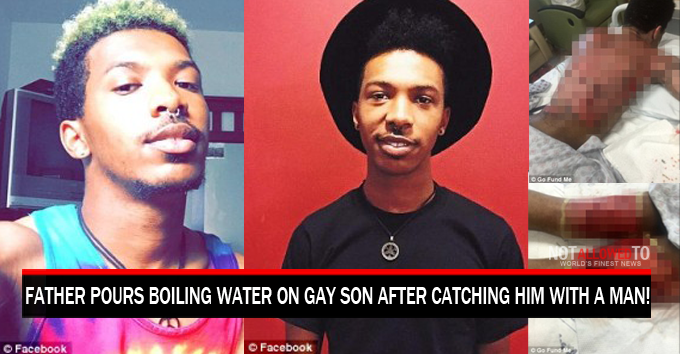 Father Pours Boiling Water On Gay Son After Catching Him With A Man! GEORGIA | A father is charged with aggravated battery after police say he burned his gay son and his gay partner, after he caught them sleeping together in apartment. 48 year-old Martin Blackwell, is charged with aggravated battery after for burning Anthony Gooden, 23, and partner Marquez Tolbert, 21. Reportedly, Blackwell allegedly doused the pair with boiling water at the apartment, before telling them “Get out of my house with all that gay sh*t” and dragged them out of the front door. The gay couple were then left to go door-to-door in the neighborhood desperately looking for help, eventually a neighbor let them in and called for help and the pair were taken to hospital. According to report, the gay couple suffered second and third degree burns to their backs, heads and necks. Mr. Blackwell, was arrested and booked into Fulton County Jail. According to a police arrest report, Blackwell was unrepentant, telling officers: “They’ll be all right. It was just a little hot water on them.” He also told officers he was disgusted by the men’s relationship, the report says. An Atlanta Police Department LGBT liaison assisted in the case to make sure Blackwell did not make bond, police said. While hate crime charges do not exist in the state of Gerogia, the liaison said federal hate crimes could be levied against Blackwell, with a hearing scheduled to address that.